the death toll at around 10,000, a figure that has been confirmed by this writer's sources in Maluku and Australia. It includes the nearly 500 refugees whose boat capsized in the stormy waters between North Maluku and North Sulawesi last month. ​Currently, two other interest groups are allegedly involved in maintaining the violence in Maluku. 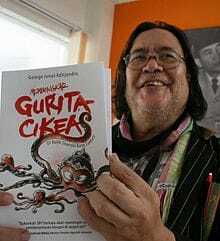 The first group are radical Muslims who oppose Gus Dur's presidency and are allegedly financially backed by a former finance minister under Soeharto. which have close links to the Soeharto family.